The Dictionary offers a cross-section of the plurality and particular of EU statuses. Individual status of European citizens is being profoundly affected by contemporary EU law. 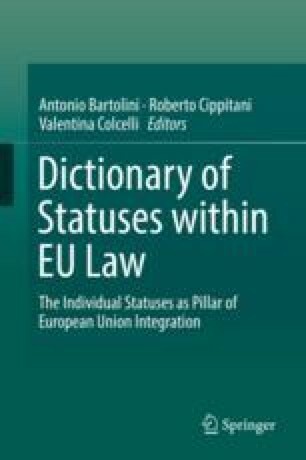 It is important to define the meaning of individual legal status under the contemporary EU law. The European Union confers rights, not only on European Union citizens, but also on persons as such. At the moment, persons with rights (citizens) and persons without rights (non-EU) are cohabiting in the same legal space (the EU area). Rights recognition, irrespective of nationality, favours European Union integration. This has led to the proliferation of special statuses that are sometimes recognised regardless of European citizenship. The proliferation of statuses opens up a world of plural citizenship and the shattering of the concept of citizenship. Anyway, EU citizenship status seems to be a sum of individual positions rather than a political synthesis of different positions. “Dual European citizenship”—one of them derived from the member states—no longer appears to be sufficient to ensure the best development of European Union integration. In any case, it no longer seems possible to think about EU citizenship only in terms of rights; rather, we must change this approach, taking into consideration the related duties. The recognition of duties will be able to guarantee the EU itself, starting with its solidarity, which is the instrument of cohesion for the community. Citizenship thus opens up plural and differentiated models, and ‘the idea of a multi-city citizenship or rather of a citizenship with multiple dimensions’ is growing.